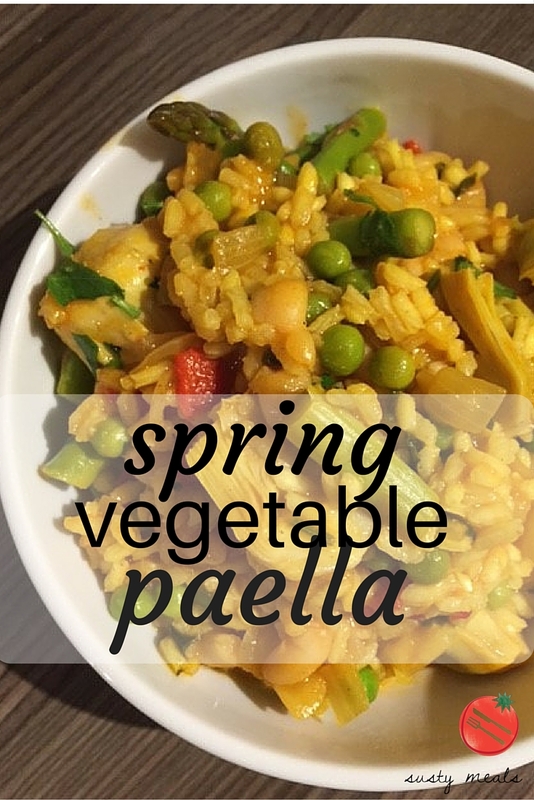 If you ever sampled the Spanish Paella before becoming veggie, you will remember the fantastic flavours and textures that come through the dish and this spring vegetable version will not disappoint, I can tell you. To be honest, although it contains spring vegetables, you can use pretty much most green veg throughout the year and so long as you have your spice blend and the artichokes you’re pretty much onto a winner in flavour terms. 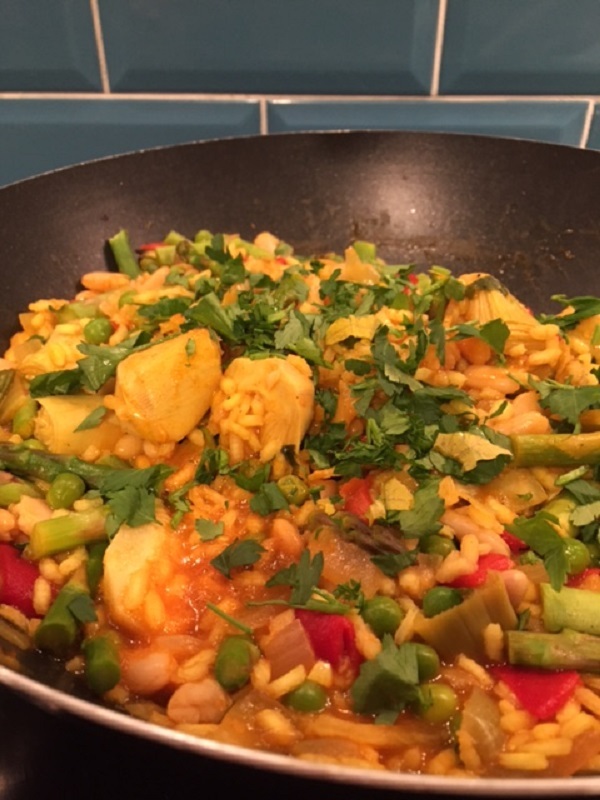 I do love a good risotto, especially one packed with flavours and colours so this certainly fits the bill. 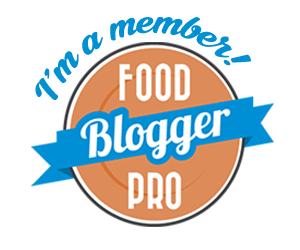 You will also have a lot of these ingredients hanging around your store cupboard (if you’re anything like me) so grabbing the veg and getting going couldn’t be easier really. I love how the artichoke adds such a distinct flavour too – and a small tin is more than enough, even though it looks piddly! 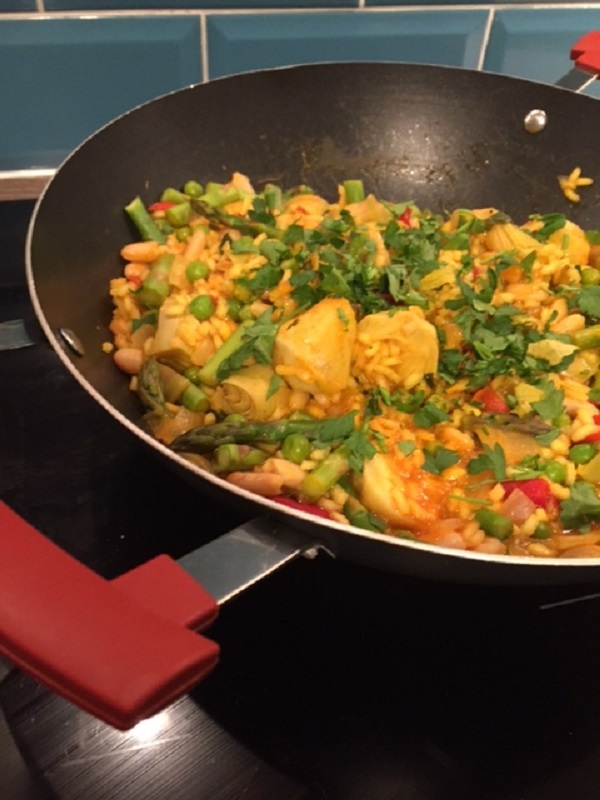 This is also very budget friendly as you use turmeric for the colour (rather than expensive saffron) and you can substitute the pimiento peppers for general sweet peppers too. 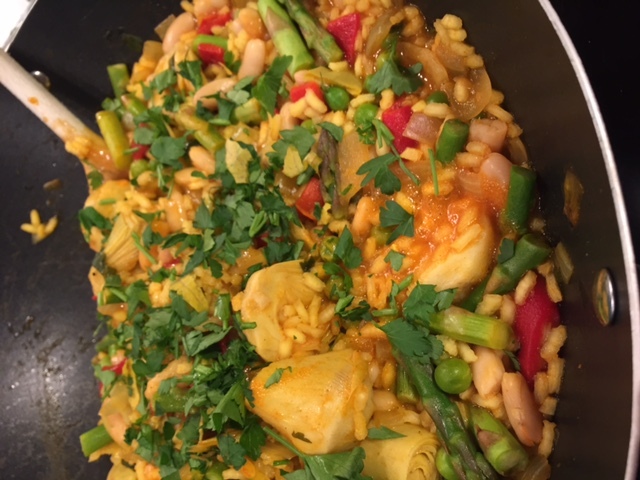 We love having what we call ‘International Nights’ at our house because it is a great way to taste different ingredients and cuisine without having to go too far 😉 Every week we try to have one meal from a different country just to shake things up a bit and having a Spring Vegetable Paella (even though it is still technically Winter) was just the thing for us last week. 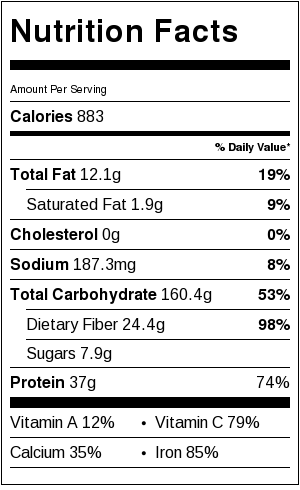 Anyhoo, I hope you have a great day and have fun in the kitchen! 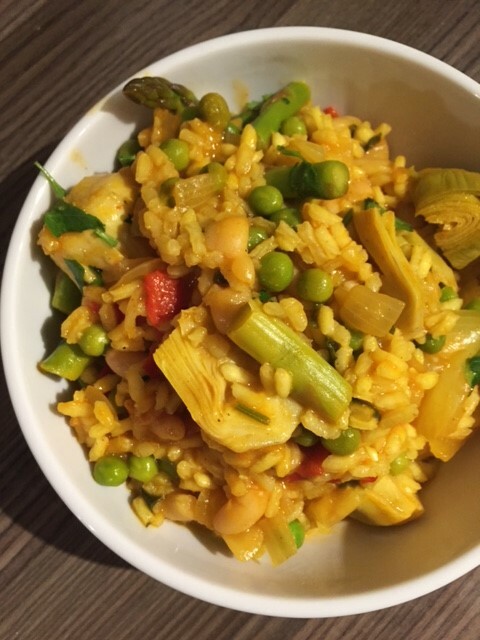 For a vegan and vegetarian friendly alternative to Paella, this spring vegetable paella has all the spice flavours and textures characteristic of the original with just vegetables and spice. 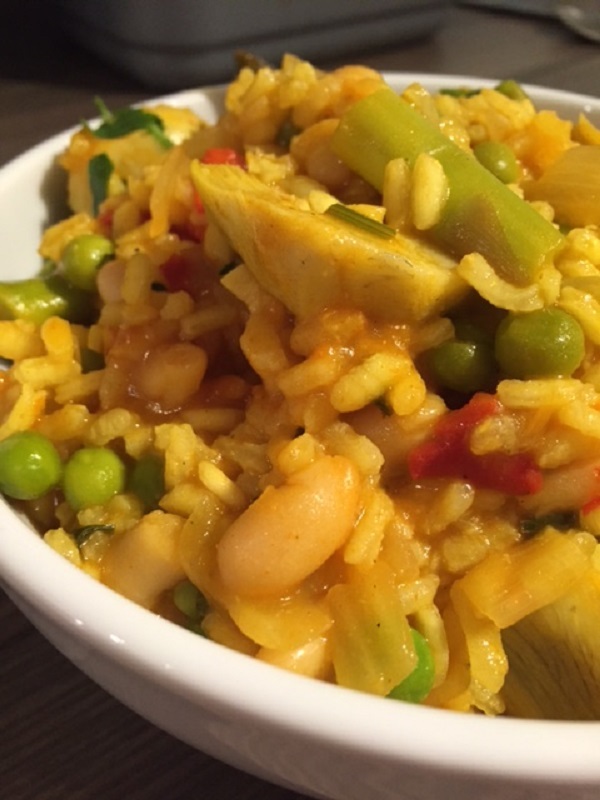 A deliciously creamy and succulent risotto packed with vegetables and flavour.